Introductory kayaking courses are run over weekends and evenings, during the summer,at venues around Bristol, under the watchful eye of one or more of our British Canoeing qualified instructors. 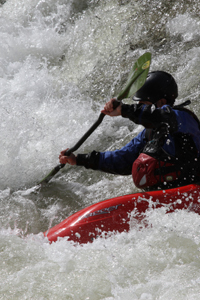 Once you have developed your general paddling skills to 2 star standard we also offer introduction to sea kayaking and/or introduction to moving water safety. This means that you can get into a kayak for the first time in April and be on your first river or sea kayak trip by the end of September. Experienced paddlers will usually be practising their paddling skills at the same time and sessions are invariably finished off with a sociable excursion to the pub, to meet old friends, make new ones and swap tall-tales of daring do! Throughout the year we run a full programme of weekend trips to a variety of UK locations and in recent years some of our members have taken part in longer excursions to places such as France, Bavaria and the Scilly Isles. Naturally, the inland rivers and coasts of the South West and Wales see regular visits from AOAC paddlers, both on organised formal trips or ad-hoc trips with like-minded people just getting together to go kayaking/canoeing. On the Bank Holiday Weekends we often join in with club multi-activity trips to further parts of the country, particularly New Year and Easter. We have gone to North Wales, the Lake District, Yorkshire and Scotland in recent years. During the summer our more experienced members enjoy playboating when the rivers are not running. These sessions are ‘peer’ led rather than coached. Monday nights at the Jolly Sailor Weir at Saltford are popular, but people gather other days of the week as well. There are also trips to Cardiff White Water Centre for those who want more challenging waves to play on.